HUNTINGTON, W.Va. – Marshall University School of Pharmacy (MUSOP) students put their skills to the test, and the winners will head west for nationals in December. 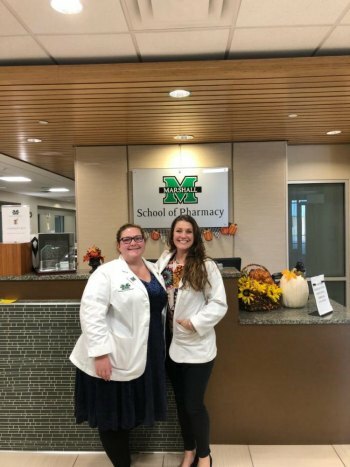 Fourth-year MUSOP students Brentney Fields, of Kenova, West Virginia, and Katie Tomblin, of Pittsburgh, Pennsylvania, won the 2018 clinical skills competition sponsored by the Marshall University Student Society of Health-System Pharmacists. The competition involved interactive, team-based analysis of clinical scenarios for hospital pharmacists. “Katie and I are honored and excited to represent Marshall at the next level of the competition,” Fields said. Fields and Tomblin will compete against other pharmacy schools and attend a December meeting of the American Society of Health-System Pharmacists (ASHP) in Anaheim, California. More than 25,000 pharmacy professionals attend ASHP meetings.